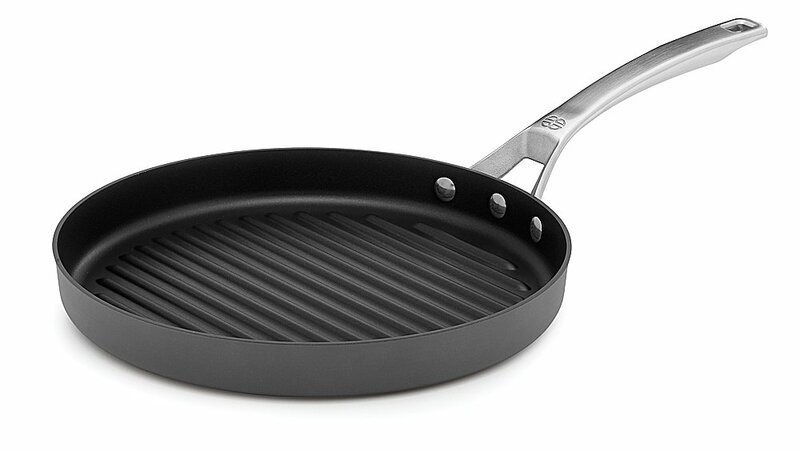 The Calphalon Signature Nonstick 12-Inch Round Grill Pan is made with a SearNonstick surface that evenly sears, browns, saute and seals in juices whencooking meats, seafood and vegetables. This grilling pan is so durable thatyou can cook with metal spatulas, spoons and whisks, and it's also dishwashersafe for easy cleanup. Now, you can have it all - a metal utensil-safenonstick grill pan that sears just like stainless. The ridged surface addsauthentic grill flavor to meat and vegetables, and brown foods evenly whilelocking in juices. It also makes great Italian-style Panini, grilled cheesesandwiches, breakfast meats, and crab & tuna melt sandwiches, and is finishedwith a beautiful brushed stainless steel handle.